Frank is an an ex-con who is slowly loosing the grasp over the reality. He is forgetful, unable to take care of himself and proud. He lives an uneventful life in his house. Frank's son is unwilling to commit him to elderly care. But he knows that his father is heading towards a miserable existence if he does not find a way to engage him. Frank needs a friend. And his son will buy him one. 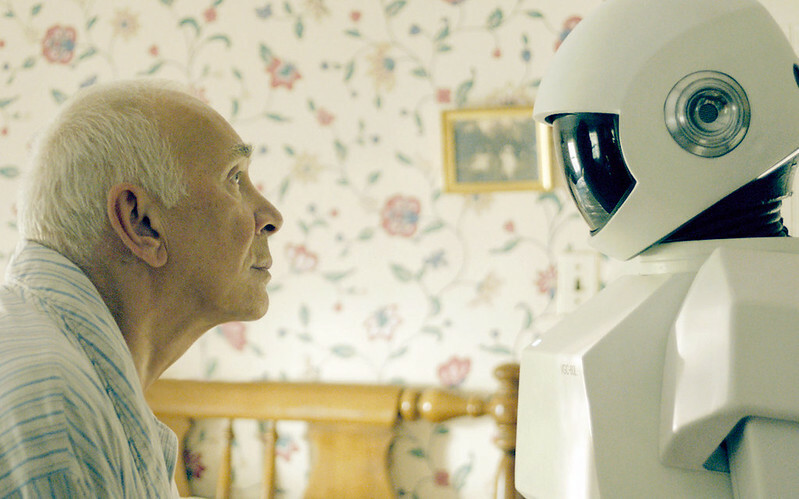 Enter robot: a buddy programmed specifically to help the elderly. The robot's sole purpose is to take care of frank's well being. He will be responsible for monitoring frank's health and taking necessary steps to enable him to reclaim his mental and cognitive abilities. To this end Frank will have to follow a fixed regime that involves routine excercise, engagement in hobbies like gardening and a balanced healthy diet. Frank: I would rather die eating cheeseburgers than live off of steamed cauliflower. Frank makes the job of robot as difficult as he possibly can. When he can't find the "off switch" he becomes harsh, moody and rebellious. 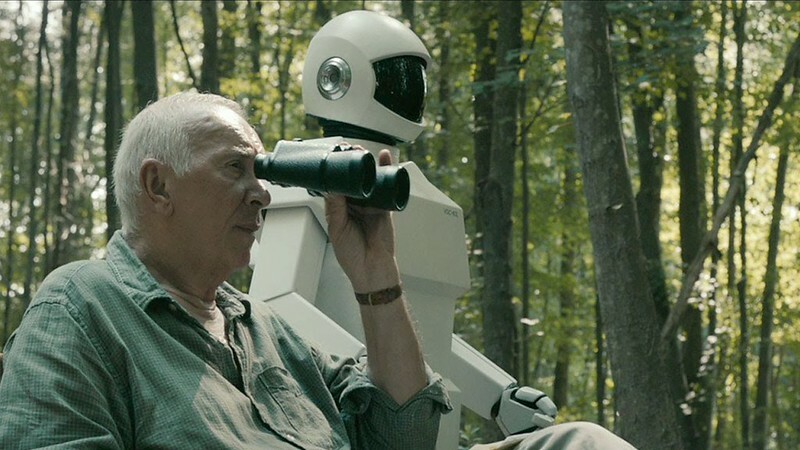 But he discovers that taking the advice of this "stupid robot" brings positive changes in his life. He relaxes his guard against him and becomes more open with him. He tells him about his adventurous past and is surprised to discover that this stringent robot is unperturbed about it. Even more surprised to know that the robot makes no attempt to stop him as he slowly reverts to his old dishonest ways. The robot approves of any method that keeps frank's mind engaged and his body well exercised. One day Frank learns that the local library is going to be transformed into a community centre. The librarian is very fond of the books there. For her Frank decides to steal the prized antique copy of Don Quixote. The robot puts a few weak arguments but in the end relents. Frank is too clever for him. After his first robbery in ages, frank tastes blood. And plans something far more ambitious. He is a true professional and although he is old he can still exploit vulnerabilities in security systems. He feels most alive in the scenes where he plans for the robbery. At the top his game. Frank: Every security system is designed by security companies, not thieves. It's not the question of if a thief can break in, it's how long. They place all the heavy systems where their customers can see them. They're selling the feel of security. He teaches robot the nuances of his craft. After all, the robot is now a key partner in his venture. He is a comrade. On the appointed night he carries out his plans successfully. And manages to steal the diamonds. This gives him a rush that he had not felt in years. He is ecstatic. And the robot is content to see him happy. Robot is more than a help to Frank. Robot is a faithful friend. Someone who cares for him when his children are too busy with their own lives. He is his partner in crime . Robot: Remember Frank, your next job. You deal in diamonds and jewels, the most value by the ounce. It's not too late, Frank. Don't give up. Lifting that high-end stuff, no one gets hurt. Except those insurance company crooks. But he wonders if his influence has even corrupted a programmed machine? Will wiping out his memory make it good again. Or perhaps, more importantly, could he just "erase the bad parts?"